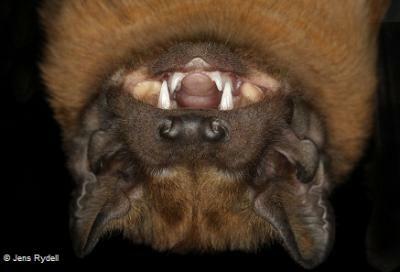 With a robust body and a wingspan of 410-460mm, the Greater Noctule bat is the largest European bat. Its snout and ears are broad and its fur is dense, long and reddish brown. This tree-dwelling species is dependent on mature forests and roosts in holes of deciduous trees throughout the year. The diet of the Greater noctule largely consists of moths, dragonflies and beetles. However, droppings samples have indicated that the species also preys on small passarines, such as robins and wood warblers, during seasonal migration. Its thin wings allow for a fast and direct flight also at high altitudes. IUCN Redlist reports a decreasing population trend. 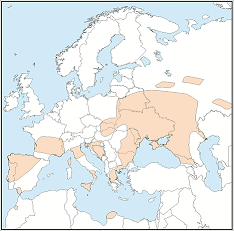 Very patchy distribution through central and southern Europe (Iberia to the Balkans, Urals) and north Africa (Morocco, Libya and possibly Algeria ). Recorded on Sicily. Range extends eastwards through Asia Minor to the Caucasus, northern Iran, Kazakhstan and the Urals in Russia. Little is known about potential threats, but loss of mature woodland and loss of or disturbance to roost sites (in old trees and buildings) may have a negative impact on the species. Some individuals were found dead at wind farms in Spain.